After the Los Angeles CVS store where she had worked for nearly two decades voted to unionize, Lorette Robinson was told that she could no longer work full-time at the store. As a devout Seventh-day Adventist, Robinson does not work on a Saturday sabbath, a practice that CVS officials decided disqualified her from full-time employment under the union contract’s “open availability” clause, despite her work record and seniority. As Robinson’s case has made its way through the courts, she has found common cause with a group of law students and faculty from Stanford Law School’s Religious Liberty Clinic, a unique program that gives law students real-world experience as advocates for people whose religious freedoms have been unjustly limited. Recently two clinic students found themselves representing Robinson before the U.S. Court of Appeals for the Ninth Circuit and advocating for religious believers in the workplace. Not long ago, law school clinics — workshops where law students learn by engaging in faculty-supervised practice in actual cases — occupied a somewhat obscure corner in standard U.S. legal education, which had long sought to distance itself from the legal apprenticeship system it displaced. In recent years, though, many law schools have moved to make clinical work a more central part of the way they train future lawyers. Students from legal clinics today provide needed legal services to those who might otherwise not have someone to argue their case. Clinics at several leading law schools have done important and influential work in areas like immigration law, unjust imprisonment, and international human rights. But when Stanford’s Religious Liberty Clinic launched in 2013, no law school had a clinic focused solely on religious liberty cases. 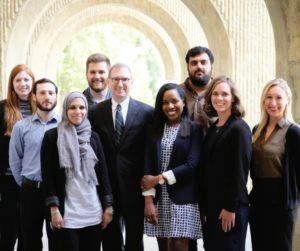 Stanford’s Religious Liberty Clinic got off the ground through what its founding director, James Sonne, terms a “remarkable confluence of interests” both inside and outside of the law school. Stanford Law School professor Michael McConnell, a leading expert on First Amendment issues and constitutional law, was an early advocate, as were outside groups like the Becket Fund for Religious Liberty, which has served as a conduit for the John Templeton Foundation’s support of the clinic. At any given time the clinic hosts cohorts of eight students who spend a full academic quarter on clinic work; they take no other courses. Sonne and the clinic’s staff attorney Zeba Huq supervise and guide the students through classroom instruction, simulations, case rounds, and in casework of up to a dozen matters at any given time. Many cases come to the clinic as referrals from partner organizations like the Becket Fund or from attorneys familiar with the clinic’s growing body of work. Impressed by the clinic’s record, the Ninth Circuit Court of Appeals has even requested that the clinic take up the case of an Arizona inmate whose religiously-based request be excused from his prison job on Jewish holidays was denied. Stanford Religious Liberty Clinic students have examined potential rights violations suffered by members of dozens of faiths, including Hindus, Rastafarians, Reformed Jews, Orthodox Christians, and Native Americans. Common themes have included the rights of the imprisoned (clinic members worked to secure a Jewish convert’s right to undergo circumcision and advocated for sensible allowances for religious headgear for inmates), religious property law (including a church’s right to serve the homeless at its property as part of its mission) as well as worker rights cases like Robinson’s. In addition to directly arguing cases, clinic students have also helped to prepare amicus briefs, often for religious groups not directly affected in a given case but interested in its broader liberty implications — for instance, arguing that discrimination faced by Hutterites in Montana affects members of the American Islamic Congress, or that Florida prisoners’ sincere religious request for kosher meals is important to a group of signers that included both the Christian Legal Society and the International Society for Krishna Consciousness. Learn more about the Stanford Religious Liberty Clinic. Watch video of clinic students presenting a case before the Ninth Circuit Court of Appeals.